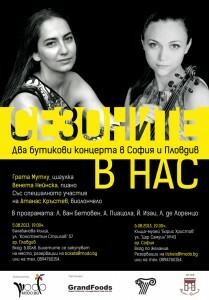 It is my great honour to announce two upcoming performances with my dear friend, the violinist Greta Mutlu. On August 5th in Plovdiv and August 6th in Sofia, we’ll present our choice of “season” pieces, including the well-known “Spring” Sonata by Beethoven as well as some bolder choices. The programme ends with Piazzolla’s Verano Porteno. In this final piece, we will be joint by the acclaimed Bulgarian cellist, Atanas Krastev. Tickets should be reserved in advance. Please, check Modo’s website for more information.